Believe Dream Create with Maria: StencilGirl THE BOOK Blog Hop! StencilGirl THE BOOK Blog Hop! Welcome to the Stencil Girl the BOOK Hop!!! So many techniques....what to pick??? Well it was no surprise that I wanted to do something with stitching. Truth be told, I was ready to fight Janet in Rock, Paper, Scissors style for the T-ease Me technique in the book if she picked it. The luck was in my favor and she picked something else so T-ease me it was! I'm a huge fan of Alabama Chanin (which this technique reminded me of) so to do it with my own stencil design was a really exciting concept to me! Oh the possibilites!!! I picked Doodle It Daisy from StencilGirl and got to work. Now, of course, I can't give you all the details of my project....you will have to get a copy of the book yourself for that, but I will show you some process photos of my project along the way. Thanks for visiting today and if you make something with this technique from the book I would LOVE to see it!!!! 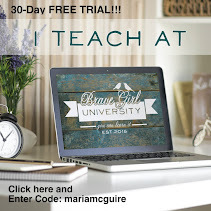 Did you visit the other blogs on the hop today???? 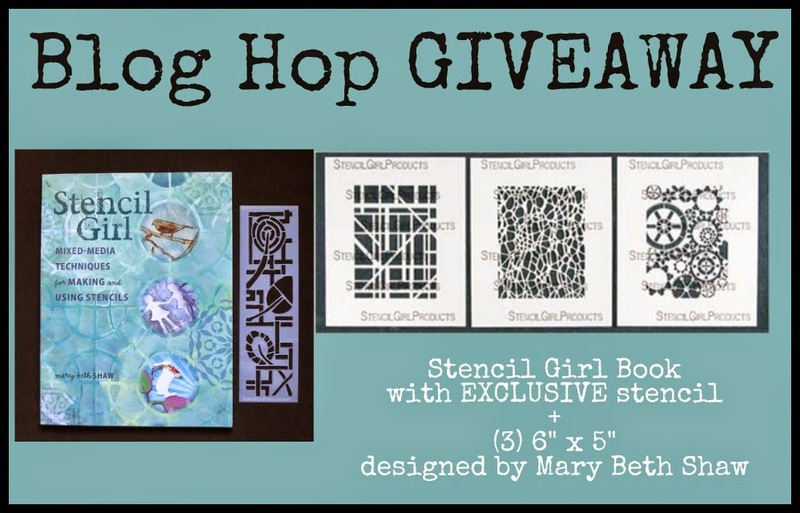 Prize: One lucky winner will receive Stencil Girl The Book with exclusive bookmark stencil and (3) 6"x5" stencils designed by Mary Beth Shaw. Your talents amaze me! :) This shirt is beautiful! Fabulous - I love this stencil !! Superb result! I can see me using this idea for cushion covers. Super cool! "T-ease me" does that mean it is a t-shirt? Your beautiful daisy design stencil makes such a pretty pattern for your work. It's so lacy and sweet. I bow down to you, Maria...sewing and patience. Beautiful. So pretty, Maria, and so feminine! 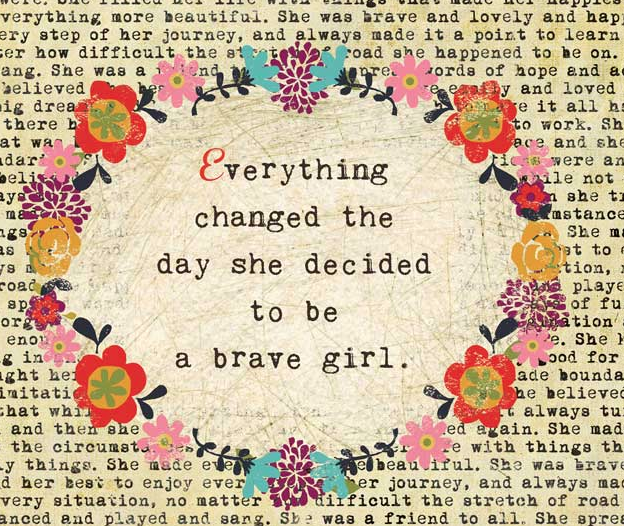 Wonderful inspiration -- thanks! This is so lovely, Maria! And what a good T-ease you are! What a great idea. I'm with you on the tape issue. Wonderful project! Love what you came up with. so pretty. guess i will have to stick with paper. never have been much of a sewer. but i am going to show this to a friend who loves to do these kind of projects. I, too, would never have thought of the tape idea--love that and your total project. And of course I also love that it is a 'fiber' project. Thank you!!! Your stitching is so even and pretty. Love the flowers. I love this technique. I am so inspired to start stitching and snipping. That is a neat project, lots of love went into make that. great idea. Hmm, I need to read up on what you have done, this looks very intriguing. Love the colour too. Flower power happening here! Love the stitching - so much I want to try it! 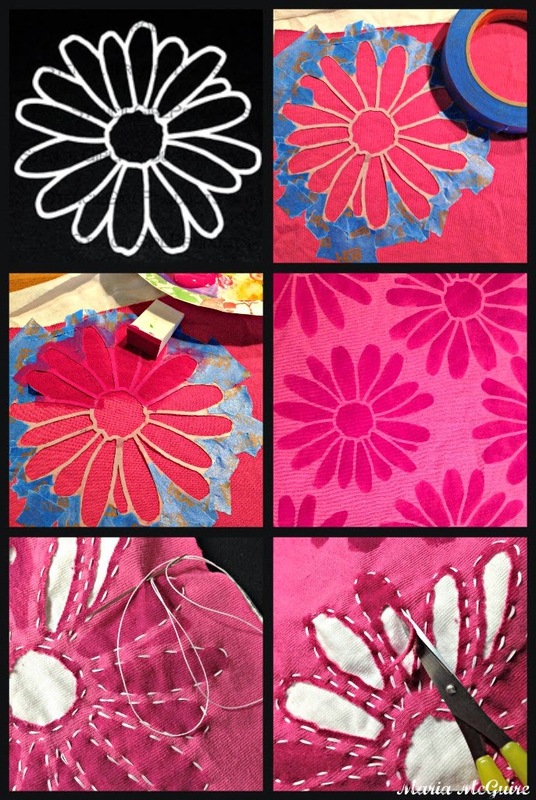 Fun to see you use the stencil with fabric - so many ideas to play with. Great giveaway! 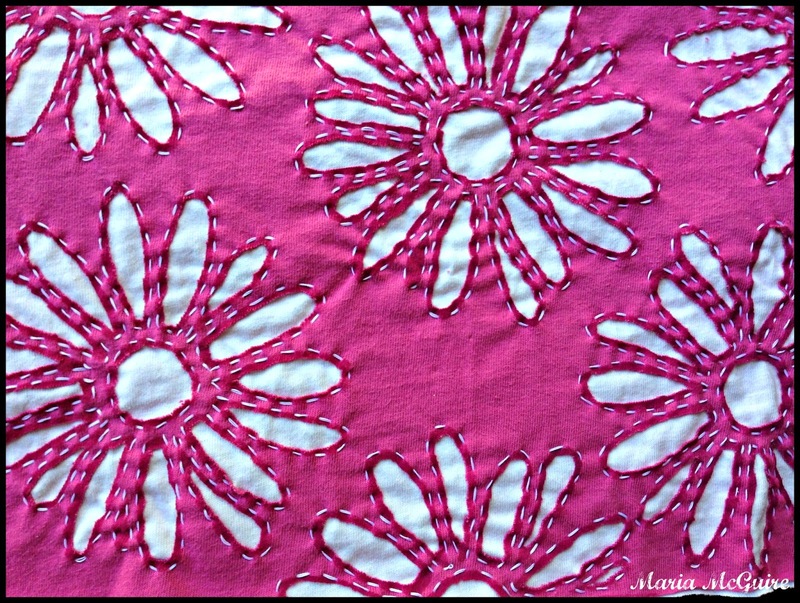 I really love it when you sew with stencils, Maria.... so much patience, and such an amazing result! I can't believe to taped it! But the results are so worth it! Sooo awesome to do a technique like this! Maria, you go girl! I like the idea of combining stencils, paint, and sewing. It's so magical...;) Great project! Wow! That's a lot of intricate stitching and cutting. Maria, I love that you do fiber and sewing projects. This turned out so nice. This week was great seeing projects from the book. Fun! fantastic and great idea, looks amazing!